The core of my being is focused on Simon’s return to Scotland tomorrow after six years working in Peru. I’ve spent the evening chatting to friends, in my living room, online and on the phone, writing in my journal and doing some very basic housekeeping. This latter is a miracle, since it included a trip to the bin area outside with the first lot of recycled paper I’ve been able to carry outside since my illness began 4 1/2 years ago. Seems pretty mundane, but not to me. I am able to take the church bus along the road on Sunday mornings now. One of the perks is a stop at the pier on the way home to pick up Sunday newspapers. I’ve just worked my way cover to cover through this weeks “Observer”, remembering how much pleasure I used to get from reading it, even though it was usually delivered on Monday, before the ferry timetable was ‘modernised’ to allow for Sunday delivery. 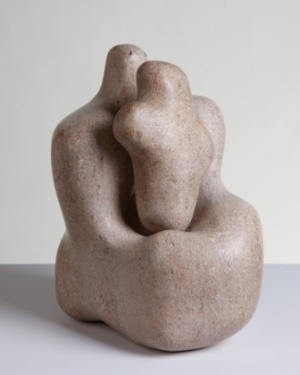 This week a wonderful article about the work of sculptor Barbara Hepworth caught my full attention and I found myself cutting out a photo of her sculpture “Mother and Child” to put in my beautiful little “Journal of Beautiful Things”. I could feel the power of it in my solar plexus and related to it immediately. I have only recently re-read “Markings” by Dag Hammarskøld, the Swedish Secretary General of the United Nations who was killed in a plane crash in 1961 when he was on the way to broker a peace agreement in the Congo. 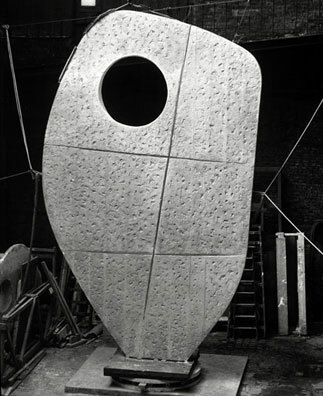 That may be why her other sculpture “Single Form” had such an effect on me tonight, so stunning in its simplicity. I don’t remember seeing it when I visited the UN building in 1966, but maybe I wasn’t ready for it then. It was commissioned as a memorial to Hammarskjøld. She captured the spirit of “Markings” exquisitely. We are so fortunate to have artists whose talents can express the essence of the things we take for granted in daily living, and express the momentous, such as this memorial. I’ve always tried with my weaving to go beyond the yarn and express the things that I feel passionate about and it was great to be reminded how much pleasure I get from being creative and being inspired by such people as Barbara Hepworth. Things will change tomorrow. I will no longer have a “younger son working in Lima”. But I can celebrate that and know that the changes in his life will be another adventure, and I can experience and distill it into my being as all mothers do.